The visioning activity offers users the opportunity to designate certain areas for housing, classrooms, recreation space and more. 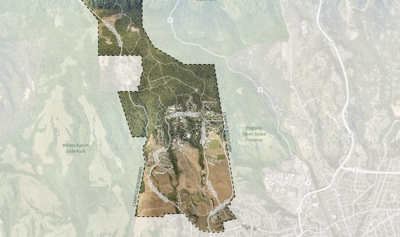 Members of the campus and local community have online and in-person opportunities to provide input and feedback as UC Santa Cruz works on a new Long-Range Development Plan (LRDP) that will guide the campus from 2020–2040. Online, people can lay out their vision for how the campus might look over the next 20 years. The visioning activity offers users the opportunity to designate certain areas for housing, classrooms, recreation space and more. The submitted ideas will be shared with the campus LRDP planning committee. The campus has also announced three community meetings through out Santa Cruz County. The sessions are designed to be interactive and ensure that attendees can spend their time learning about and giving feedback on the topics of greatest interest to them. The meetings are structured to accommodate a variety of schedule constraints so individuals can come and go at their convenience. Attendees will be able to drop by various information stations on water, transportation, housing, environment/ecology, and carbon/energy. Participants can share concerns and offer suggestions and/or possible solutions for each of these topics. There will also be an interview/survey station where attendees can share their thoughts, concerns and ideas about any aspect of the LRDP. Midway through the forum, there will be a question and answer session. The campus announced in May 2017 that it was beginning the process to draft a new Long Range Development Plan to guide the campus from 2020 through 2040. What's a Long-Range Development Plan? A Long-Range Development Plan serves as the campus’s general planning framework. An LRDP designates campus areas for certain types of uses, such as housing, classrooms and recreation. It’s not an approval to develop facilities or a mandate for growth. It’s an important planning tool for providing the infrastructure needed to successfully educate students. The planning committee is tasked with considering how the campus might serve up to 28,000 over the next 20 years—an annual growth rate of about 2 percent.